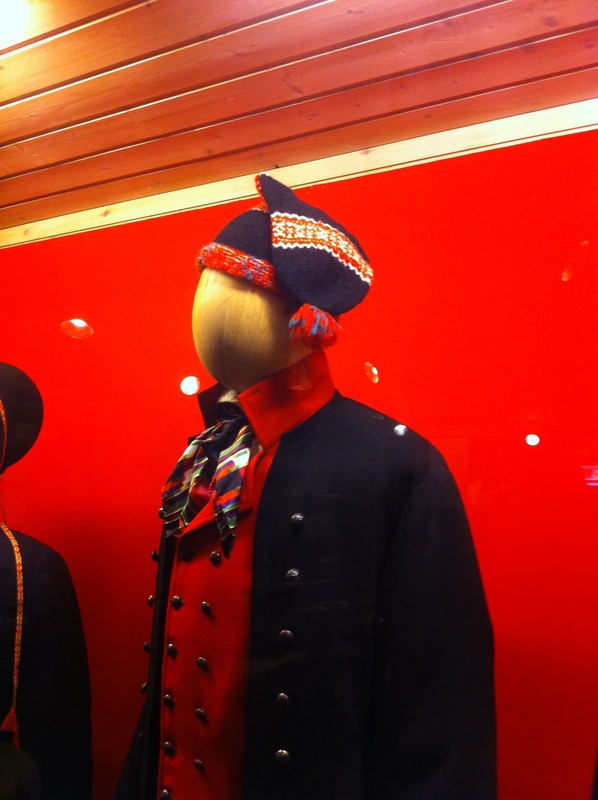 Traditional Norwegian costumes – bunads – are all about status. Silver, embroidery, expensive imported fabrics, beading, elaborate headdresses – there were many ways to use clothing to show your wealth or identify where you live or your marital status. Each costume element has meaning and symbolism. During the trip we heard some interesting stories about head coverings. Hege Therese Nilsen, who taught the knitting class on the Vesterheim Textile Study Tour, has worked for Husfliden in Bergen for nine years, specializing in bunads. Early on, when she had been working for only a month or so, an American woman came in asking about obtaining a cap for the Hallingdal bunad. A cap? Hege Therese replied that she knew of no cap for the costume, only the elaborate white headresses. A co-worker kicked her under the counter, and later explained the Norwegian-American tradition. 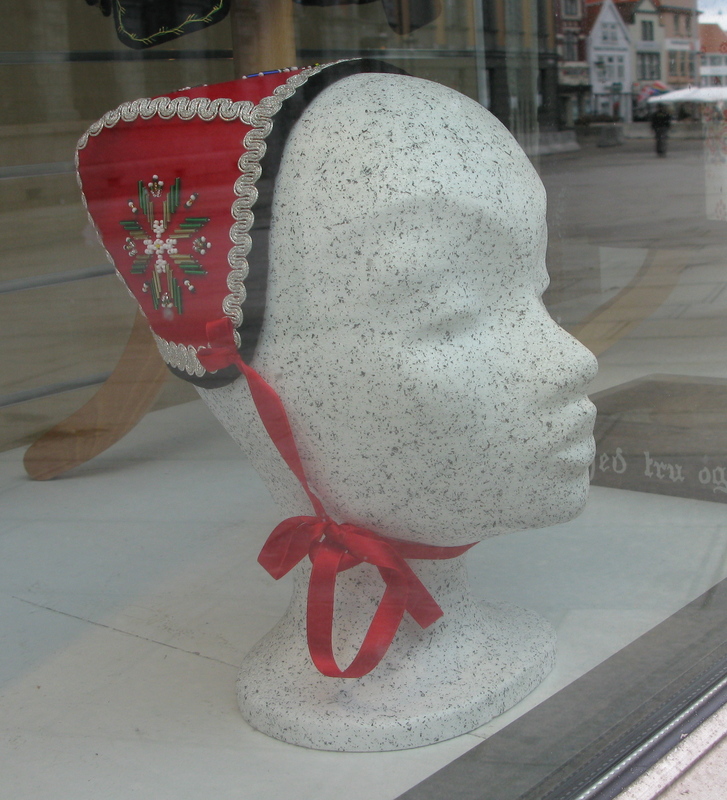 It was difficult for immigrant women to care for the white head coverings and some women in America began added an embroidered cap to their bunads, one that would have been worn only by a child in Norway. Hege Therese also described a pointed knitted cap for men, topped with a tassel. If a man walked down the street with the tassel in front, let him pass. He was intent on his mission. On the other hand, if the tassel was flipped to the back, he was ready to chat and visit. Hege Therese joked that her husband could use that cap when he was coming home from training, which I assumed meant working out. He talks to everyone. “It takes him and hour and a half!” she said. 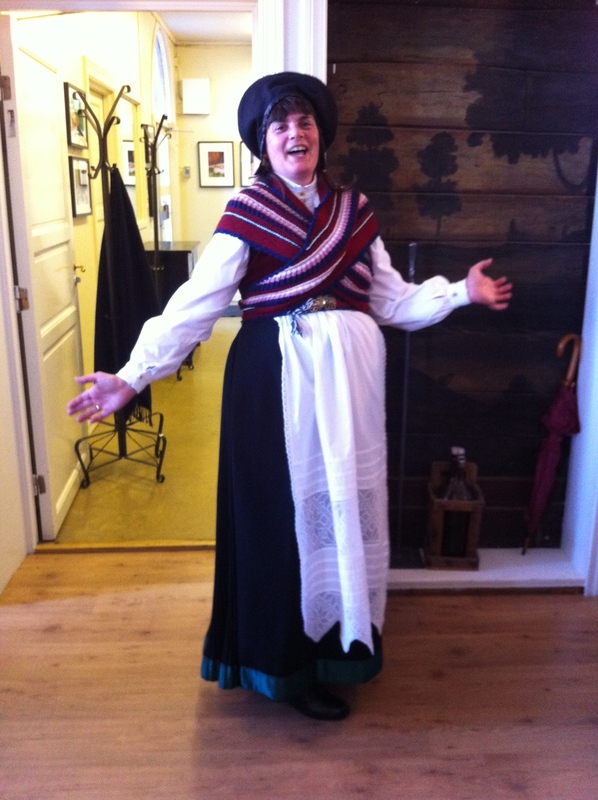 When we visited the Sunnhordaland Museum another story was told about that cap by hatmaker Kjersti Mo. Some men who wore the man’s Sunnhordaland bunad didn’t like the cap, which looks a bit un-serious. So Kjersti did research in photos of the late 1800s and discovered that many men wore a black hat. Now that has become an alternative choice to top off a Sunnhordaland man’s bunad. At the Norsk Institutt for Bunad og Folkedrakt, Camilla Rudrud talked about the use of costume to clearly identify a woman’s status within the community. For example, when a woman was married, the band at the bottom of her costume may change color. The head coverings would change. It was easy for a young man to scan the room at a gathering and to know just which women were unmarried, and where they lived. In the Hallingdal costume the head covering for a married woman was elaborate; hair braided together with woven bands, covered with a stiff fan-shaped form, tied with a silk scarf. and draped with a white kerchief. 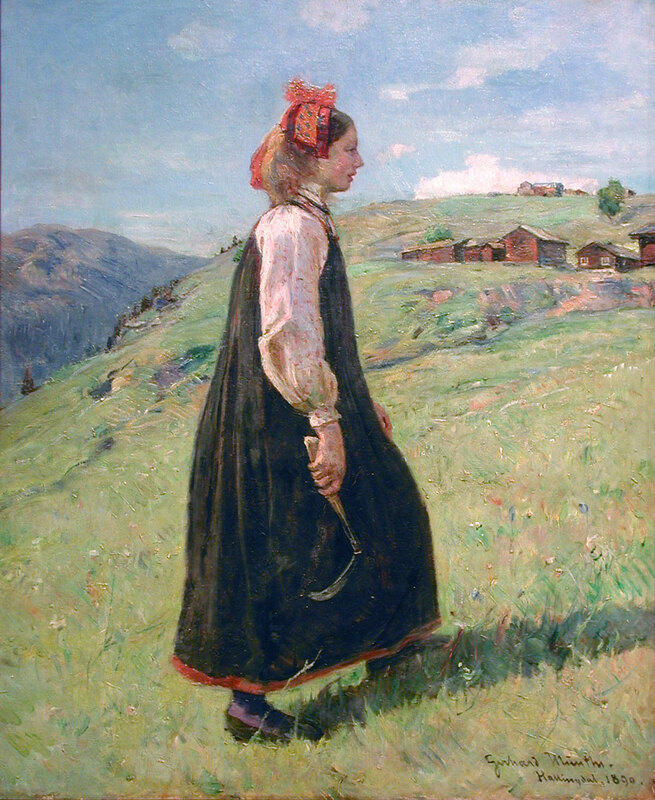 Unmarried women wore a giant pom-pom-like tassel on the tops of their heads, like the one shown in this painting by Gerhard Munthe. If you were an unmarried woman of any age you still wore the tassel. Camile knew of documentation of women into their nineties still using the pom-pom headband that was much more suited to a youthful face.